St. Luke is happy to provide several athletic opportunities for our parishioners. Some CYO opportunties start at grade 3, but please check out the sports and grade offerings for each sport season. To register for these sports please click the status button for the sport you are trying to register. 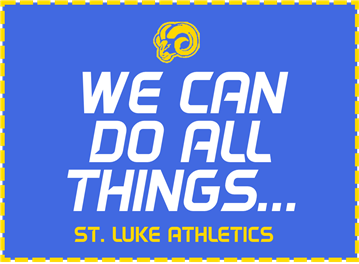 Once you have registered at St. Luke, you must then register at CYO for each sport that your athlete intends to play throughout the school year. St. Luke registration collects payment, but CYO registration ensures eligibility and that you understand all sport policies. You are able to register once at the start of the year for all sports. If you have any registration or payment questions, please contact Cory Hernandez, Co Athletic Director. If you do not already have a St. Luke account, click here to set up your web account username and password. If you do have a St. Luke account, just click on the registration below. All late registrations will be charged a $25 late fee!! All sports will be available for the program year after July 1, 2015. Please register your child at one time for EVERY sport you THINK they will play in the upcoming program year. This assures us your child is in the database for that sport when we create rosters. You must register your child for EACH CYO Sport. If you register your child within the posted regular registration deadline and you decide to withdraw, you will be given a refund for the entire amount minus a $15.00 processing fee. Once evaluations have taken place and teams are drafted, NO REFUNDS will be given for withdrawals from the sport. Please note: in the case of the sports without an evaluation process (cross country, football, cheerleading, soccer, baseball, softball and track), NO REFUNDS will given once the first practice has occurred.